Q: The United States has formally submitted a document to the World Trade Organization (WTO), stating its opposition to granting China market economy status, which could mean that the US is able to maintain high anti-dumping duties against Chinese exports. What's China's comment? A: We have noted relevant reports. The spokespersons of the Commerce Ministry and our Ministry have talked about China's position on this issue many times. The concept of the so-called non-market economy can be found in no multilateral WTO rules, since it was created by several countries during the Cold War and only incorporated into domestic laws of a scanty few of the 164 WTO members. According to the Article 15 of China's Protocol on the Accession to the WTO, the surrogate country approach in anti-dumping cases must be abandoned as scheduled in the Protocol. It has nothing to do with whether China meets the so-called standards of market economy status or not. Some countries and individuals are trying to force a connection between these two just to serve their purpose of pulling the wool over the eyes of the public. It is written down in black and white in the Article 15 of China's Protocol on the Accession to the WTO that the surrogate country approach used when calculating anti-dumping measures against Chinese exports must be terminated on December 11, 2016. This is clear-cut and beyond dispute. All WTO members should faithfully honor their pledges, strictly observe the rules of the international law, and earnestly fulfill their obligation under international pacts. Q: Japanese Emperor Akihito will abdicate on April 30, 2019. He is the first Japanese Emperor to visit China. How do you comment on Emperor Akihito? What do you think of his abdication? A: What you said is Japan's domestic affair on which we have no comment. Emperor Akihito visited China in 1992 and held meetings with the Party and state leaders of China many times. He has played a positive role in promoting the development of China-Japan relations. 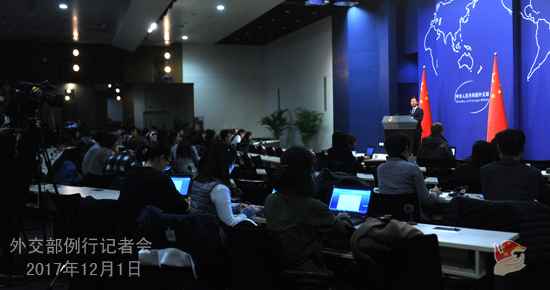 Q: Does China believe that the US objection to China's market economy status will damage China-US trade ties? What about China-US cooperation on the Peninsula nuclear issue, as the US is also seeking your cooperation on that one? A: As I said, the concept of the so-called market economy only exists inside several countries, not in the WTO rules. By introducing this concept, the relevant countries meant to confuse it with the obligation under the Article 15 of China's Protocol on the Accession to the WTO, thus skirting their own responsibilities. We once again urge the relevant countries to strictly observe the international law and international norms and honestly fulfill its obligation under international agreements. As for whether it has any impact or not on China-US cooperation on the Peninsula nuclear issue, China's position on this issue is very clear. In fact, we remain in communication with the US side on the Peninsula situation. You may have noticed as well that President Xi Jinping had a phone call with President Trump at the latter's request, during which they exchanged views on the Peninsula situation. 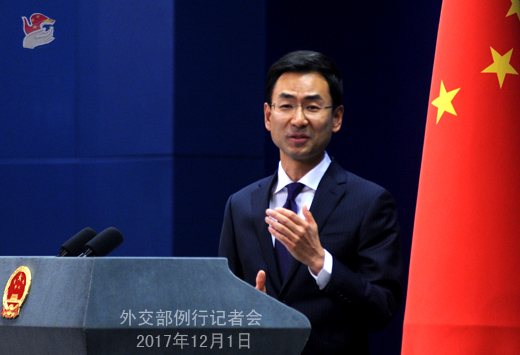 We believe that China and the US are on the same page when it comes to realizing denuclearization of the Peninsula and maintaining its peace and stability. We hope that the US could work with China and the international community to bring the issue back to the right track of settlement through dialogue and consultation at an early date. Q: A Russian parliament member said upon return from a visit to the DPRK that the DPRK has explicitly rejected the "suspension-for-suspension" proposal. Does China know anything about that? Has the Russian side informed the Chinese side of this? Have you ever directly raised this proposal to the DPRK side and what was their reaction? A: On the Peninsula nuclear issue, China and Russia have the same stance and have been in close communication and coordination. 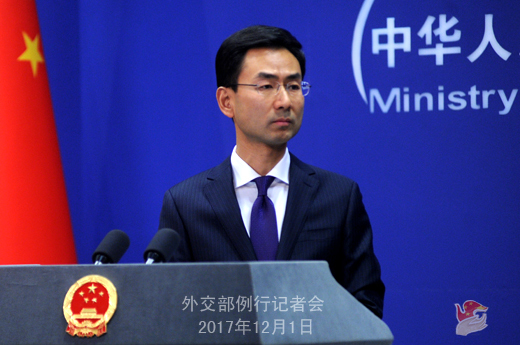 The joint initiative, a legitimate and reasonable one based on the "dual-track" approach and "suspension-for-suspension" proposal of China and the step-by-step vision of Russia, takes into full account and accommodates in a balanced way the concerns of all relevant parties and contributes to properly resolving the Peninsula nuclear issue. We hope that all relevant parties could show their goodwill and flexibility, and endeavor to cool down the situation on the Korean Peninsula and bring the issue to the right track of settlement through dialogue and consultation at an early date. As for the proposals separately raised by China and Russia as well as our joint initiative, the DPRK knows them very well. Q: Senior officials in the US administration have said that President Trump plans to potentially replace Secretary of State Rex Tillerson with the head of the CIA. I'm aware that China doesn't comment on internal affairs of other countries, but can you comment on whether China believes it had a good working relationship with Secretary of State Tillerson, particularly over cooperation on issues like the Korean Peninsula nuclear issue? A: You actually answered your own question. The appointment and removal of senior officials of the US government is their domestic affair. We have no comment on that. We would like to work with US officials in charge of diplomatic affairs to ensure the sound and steady development of China-US ties and safeguard regional and international peace and stability through enhanced communication and coordination on regional and international issues.